Superyacht Helipad Design. World Leading Consultant. 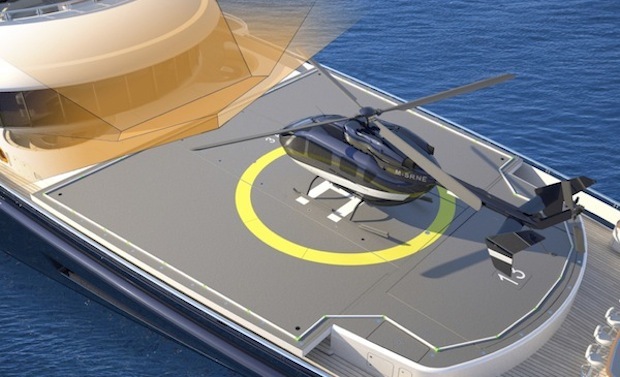 Thinking about superyacht helipad design? If the process of integration of a helicopter aboard a super yacht is considered from the very beginning then the probability of commercial certification becomes much more likely. Commercial compliance of the heli deck will allow it to be used freely both privately and commercially with the yacht and helicopter operators. This will remove the current ambiguity that can exist with a non certified deck particularly with regard to insurance cover. A Commercial deck may also add potential revenue if the vessel is being chartered and will enhance the asset value of the yacht at the point of sale. Commercial compliance can be divided into the “hard wear” of design and outfitting combined with the “software” of procedures and training. The “hardware” phase must be addressed from the very beginning and followed continuously throughout the build process. Procedures and training tends to be addressed towards the end of the build process but prior to delivery and the helideck becoming operational.